The 50th Anniversary of Martin Luther King’s “I have a Dream” speech today on Wednesday 28 August 2013 provides a useful opportunity to recall the background to King’s historic public speech, the vision espoused and progress made towards a more equal, harmonious, open and welcoming society. Martin Luther King is a personal hero who has influenced my views since a teenager. With posters and pictures of King around my home I constantly recall his vision for a fair and free society on almost a daily basis. 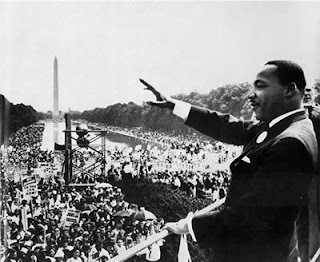 Delivered from the steps of the Lincoln Memorial, Washington on 28 August 1963 to over 250,000 civil rights supporters, Martin Luther King Jnr captured the mood of a nation and globe eager for change, helped deliver a largely trouble free rally and can be attributed to ensuring passage of Civil Rights legislation, award of the Nobel Peace Prize and Man of the Year title from TIME magazine to King. Today, fifty years later, we have achieved much progress with President Barack Obama in office, Apartheid abolished in South Africa and racial equality legislation in Northern Ireland since 1997. Looking forward, my role along with other Civic Leaders must be to courageously commit ourselves to delivering Martin Luther King’s aspirational vision at home and further afield to realise the collective dreams of everyone whether Black or White, Catholic or Protestant, Rich or Poor, Republican or Loyalist, Male or Female, Disabled or able bodied, Married or Unmarried, Unionist or Nationalist, Gay or Straight, Old or Young. A Home for Everyone is my dream. I have a few ideas on how to deliver it but I want to hear yours. Only by Working as One can we deliver the collective dream of shared, integrated society. I can be contacted via email mail@andrewmuir.net or Facebook, Twitter (AndrewMuirNI) or write to me at the Town Hall, The Castle, Bangor, BT20 4BT. Together we shall overcome.